Jacky Ickx took victory at the German Grand Prix in what The Times described as "the most brilliant race of his career", after an epic battle with Jackie Stewart, who came second. The result just about kept the season alive - had Stewart won he would have been crowned champion. The pair of them had also dominated the practice sessions, with Stewart setting a lap record only for Ickx to better it. But the build-up was overshadowed by the death of Gerhard Mitter whose privately-entered Formula Two BMW left the track and ploughed into trees. Interest on the grid surrounded the entry of Mario Andretti in his first F1 race in Europe in the Lotus 63. There was also a contingent of 13 Formula Two cars. Ickx's good work to secure pole was undone when he made a poor start and was passed by a number of cars headed by Stewart. Andretti's day ended in a flash as he lost control of his Lotus and smacked into a fence, wrenching off two wheels, one of which hit Vic Elford and caused him to crash. He suffered a broken arm and shoulder. After two laps Stewart was clear of Jo Siffert and had become the first man to do a circuit of the Nürburgring in under eight minutes, but Ickx in the Brabham was even faster and by the third lap he was second and catching Stewart. On lap six the pair swapped the lead a couple of times, but then Stewart started experiencing trouble with his gears and dropped back. Jo Siffert lost third place when his suspension snapped and he crashed with a lap to go, allowing Bruce McLaren to complete the podium. Graham Hill came home fourth, the last Formula One car to finish, although the results show Siffert fifth and Jean-Pierre Beltoise sixth. 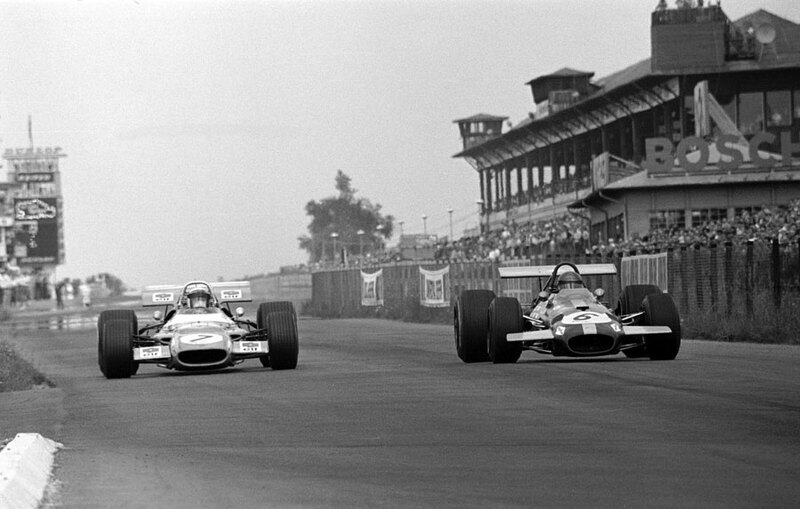 Ahead of them were no fewer than six of the 1600cc F2 cars headed by the Matra of Henri Pescarolo.